Just like birds gotta fly and bees gotta sting, dogs have to chew. To avoid your puppy or dog chewing into your favorite pair of shoes or brand new furniture (heck, even your old furniture.) rawhide bones can act as a deterrent. 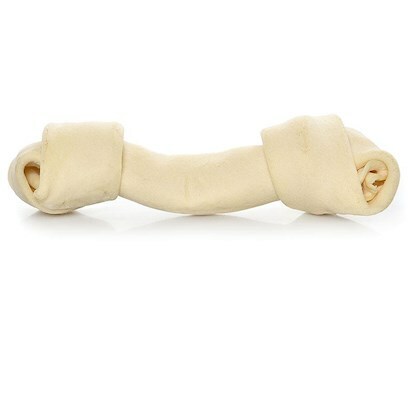 By chewing a rawhide bone dogs' jaws strengthen, his or her teeth are cleaner and even their breath freshens up. Dogs that chew regularly on rawhides and other bones or toys have less plaque and tartar buildup on teeth. It also is a great way to keep your dog distracted, or reward them after a long walk. They have absolutely no side effects. However, all real bones pose a minimal risk of splintering. Therefore, it is recommended to supervise the dogs chewing sessions and to take away any small piece that may break off. Some dogs are allergic or sensitive to rawhide. This usually manifests in diarrhea after ingesting. Inner layer of cow or horse hides cleaned and cut or ground. Consider size, shape, hardness, and flavor and choose a bone that matches your dog's chewing rate and chewing habits. They are available in a variety of flavors. The flavored Bones come as Multi-Pack Extra-Thick Chips (up to 5-1/2 " long by a full 1/4" thick), Multi-Pack Twisted Chews, or Multi-Pack Bones to delight your dog with hours of flavorful chewing.